Fifteen-year-old Corinne LaRoche’s life changes one evening when she returns home and witnesses her father being harassed by racist French policemen. That’s it! Her frustrated father decides the family is leaving France and moving back to Canada. After boarding the beautiful Titanic, Corinne meets Christopher, the Captain’s nephew. Coming from a wealthy British family, Christopher is privileged in every way. 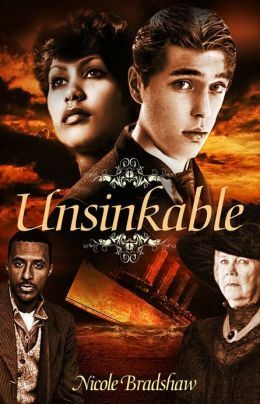 He matches perfectly with Sophia, the daughter of a dear family friend he plans to wed.
Unsinkable is the tale of how two teens from seemingly different worlds come together amidst a tragedy that changed thousands of lives forever. They could have never imagined their impending fate as well as the family secrets revealed four days before the sinking. This novel gives a day-by-day account of the doomed voyage as told from a minority perspective. Fifteen years ago, Laurel Handfield was a single woman living in a tiny one bedroom in the suburbs of Philadelphia. She worked a monotonous nine-to-five handling copy equipment leases. One day she decided to get back to what she loved most—writing. She decided to write a novel. But what would it be about? A month later, she went on vacation to the Bahamas. In true Stella fashion (See Terry McMillian-How Stella Got Her Groove Back) she met a Bahamian. The rest is history, as they say. She came back from vacation, quit her job several months later and moved to Maryland to live with her sister while she wrote her first novel based loosely on how she and her husband first met. She has since moved to the Bahamas where she has lived for thirteen years with her husband, three children and Abigail, the family hamster. She writes full-time. Her first upper middle grade novel, Unsinkable, will be released May 21, 2013 by Simon & Schuster/Strebor Books. Unsinkable gives the day-by-day account of the only black family aboard the doomed Titanic. The prequel novella, A Bond Broken, is an ebook that will be released April 16th for the anniversary of the sinking. Both novels were written in her penname, Nicole Bradshaw. Her first picture book, Cassi da Conch, will be released by Xist Publishing in 2014. Both novels are available on Amazon.com and Barnesandnoble.com.